Was there ever a more awesomely jammin’ place and time than the state of Maryland in the 1980s? Well, the answer is probably yes, but thanks to the documentary evidence produced by filmmakers Jeff Krulik and John Heyn, it’ll be awfully hard to prove. The pair immortalized ’80s Maryland party atmosphere in their now legendary underground documentary Heavy Metal Parking Lot (HMPL), in which they chronicled the shenanigans going on outside of a Judas Priest concert. That film is probably one of the most iconic artifacts of ’80s culture ever created during that decade. 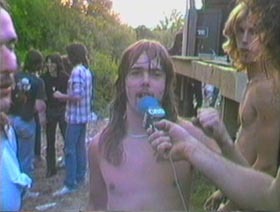 The main difference here is that the original ’80s footage used throughout Heavy Metal Picnic was not shot by Krulik and Heyn. Instead, the footage they acquired was made by a guy named Rudy Childs during Maryland’s — and possibly the entire free world’s — biggest, baddest, rockin’-est heavy metal “farm party”: The 3-day Full Moon Jamboree organized by the entrepreneurial Billy Gordon. This was a non-stop 36-hour party that was so huge and so out-of-control that it made the local nightly news and laws had to be written afterward to prevent such a happening from occurring ever again. Childs’ original video footage of the Jamboree, while vastly entertaining, doesn’t quite have the same panache and flair that Krulik and Heyn brought to HMPL. One of the things that make Heavy Metal Parking Lot so special is the way the filmmakers, playing the role of bemused outsiders, really get their subjects to open up through their easygoing, chatty interview style. That charisma of Heyn and Krulik’s — plus their ability to stay sober while filming — eluded Childs and whomever else he handed his camera off to. But, he didn’t quite have the same intentions of making “a film,” either. He appeared just to be making a goofy home video recording of the Jamboree, walking around with a camera and a microphone wrapped in a CBS logo swiped from the videotaping of Ronald Reagan’s 2nd inaugural. If Heavy Metal Picnic was just Childs’ raw footage edited together, it would be a nicely entertaining film. But, what makes the documentary really shine is that Krulik and Heyn tracked down several of the Jamboree’s attendees and organizers and interviewed them about their recollections. For a few, that statement is apparently very, very true. But, luckily, many others have either fairly clear recollections or just need their memories jogged by Krulik showing them the old footage on their TVs in their suburban middle-class living rooms. Some still hold on to, strongly even, their heavy metal rockin’ ways. For example, Ronnie Kalimon, the drummer for Asylum, one of the bands that played on the Jamboree’s outdoor stage, still has his long-hair and performs with heavy metal bands. While that’s interesting, what’s really cute is to see the original Jamboree footage where Kalimon walks by and pays no attention to the hot girl backstage who, after formally meeting under different circumstances later in life, would eventually become his wife. Then there’s Billy Gordon, the dude who planned and promoted the entire Full Moon Jamboree, who has since moved to Huntington Beach, CA, but still retains his head bangin’ mullet and runs a non-profit charity for bikers. For their post-HMPL careers, Krulik and Heyn have periodically extended the “parking lot” concept with quasi-sequels such as Neil Diamond Parking Lot, Harry Potter Parking Lot and a very short lived Parking Lot TV series. But this is the first time they’ve returned to their heavy metal roots. It’s a return that’s been long in coming and has turned out to be a raging success. Heavy Metal Picnic is like being invited to an awesome 30-year reunion party. Then, if you go, just claim that you were at the original event — because nobody will remember if you actually were or not. a hidden treasure of 80’s heavy metal scene, so funny i cant believe i was seriousely one of them in the 80’s, i wish they had flat irons back then. Ronny walked past his future wife because she was his lead guitarist’s Dale’s) girlfriend. Ronny’s girlfriend, at the time of the party, was the blonde holding onto his chest in the photo.